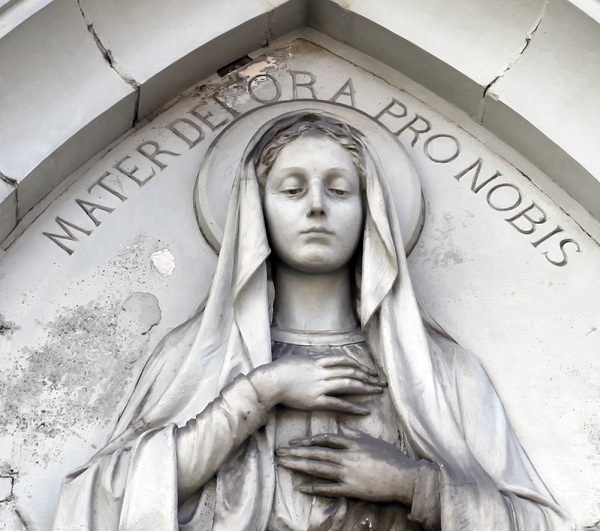 A very Art Nouveau Madonna over the main entrance to the former school. Those who have the misfortune to make the daily commute on Metro North have undoubtedly noticed a strange open church tower – remarkably high and slender – as the train approaches 125th Street. 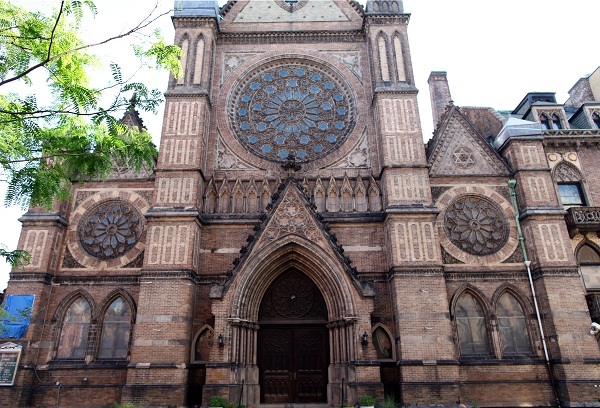 A few blocks from the station, in a quiet section of Harlem, the inquisitive visitor finds an extraordinary sight: a vast church in polychromed brick, seemingly transplanted from Venice , Siena or Lombardy. 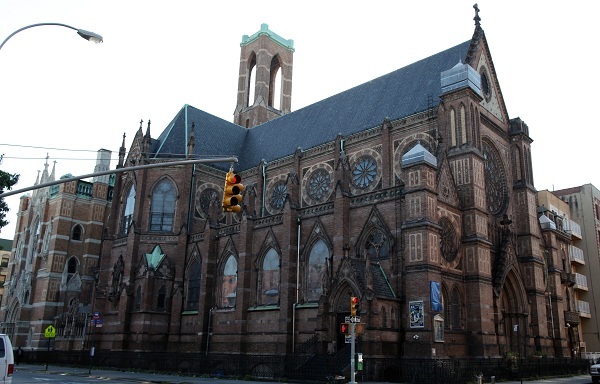 It is the Catholic parish of All Saints, one of the last masterpieces of James Renwick, Jr., the architect of St. Patrick and Grace Church. You may be dazzled by the sheer scale of decoration, but closer inspection reveals sad evidence of neglect. Niches stand empty, weeds grow out of cracks and signs of damage to windows and stonework abound. A picture of this church in 1913 reveals seemingly innumerable spires and finials that have since disappeared. 2) Most noticeably, the main tower has lost its spire and louvers, giving it its present unusual silhouette. The rectory – the interior is anything but a palace after years of neglect. Perhaps the most elabrately decorated parochial school in New York. It closed as recently as 2011. Entering All Saints, our visitor may feel a bit of a letdown. 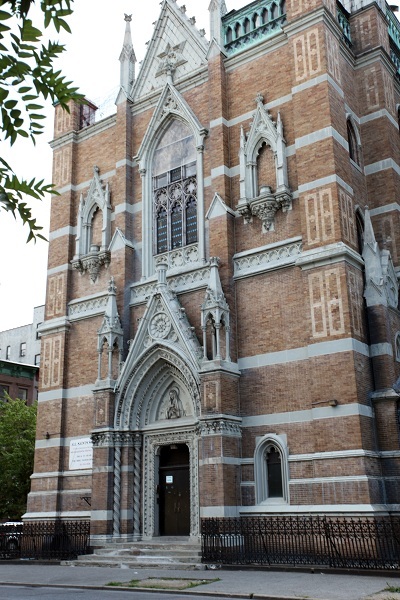 The overflowing abundance of the exterior details has somehow awakened expectations of a correspondingly vast interior, yet All Saints is of no more than average size for a New York parish. A closer look, however, reveals that the interior of All Saints is largely a smaller scale version of St. Patrick’s Cathedral! Renwick has merely enclosed the French/English/German Gothic of St. Patrick’s in a new, entirely different, Italian Gothic shell. 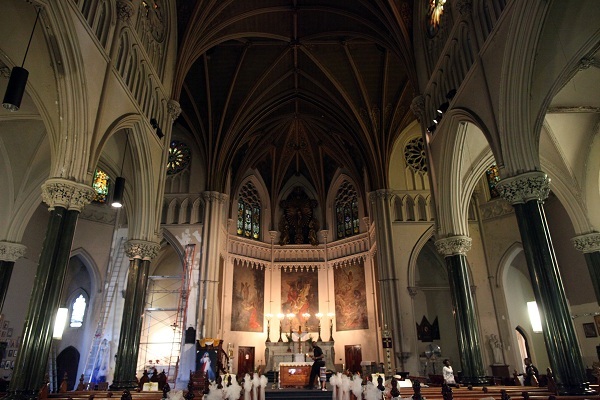 We can see why All Saints sometimes is called the St. Patrick’s of Harlem. One pauses to admire the architectural details of the nave and transept which are of a very high order. 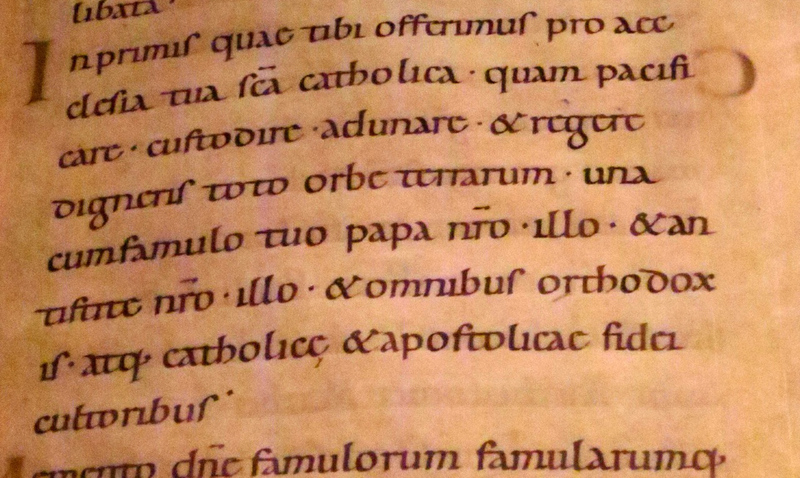 Only the execution of the apse/sanctuary is in a somewhat simplified and summary style compared to its counterpart in St. Patrick’s. There is much else to see. 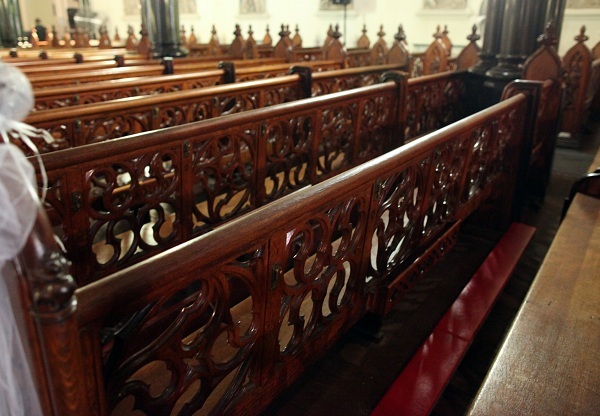 First, All Saints boasts the finest pews I have ever seen in a Catholic church in this country – in the Gothic style, elaborately carved and finished. 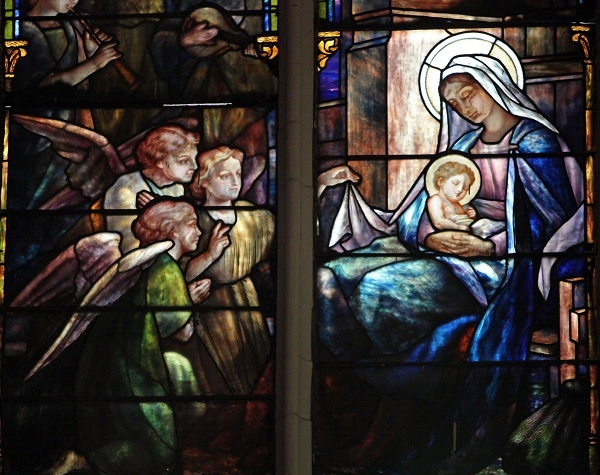 Second the stained glass windows – much of them non-figurative – are of extraordinary quality. 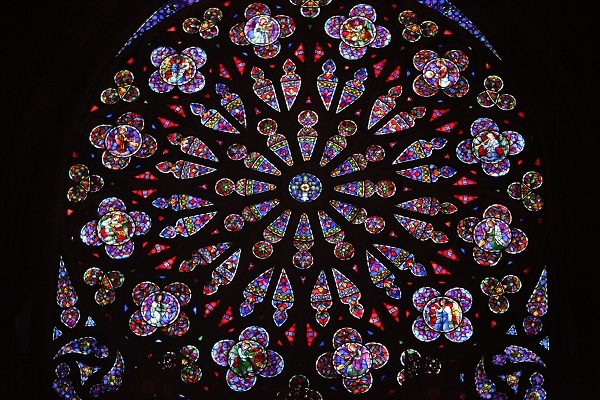 The colors – blue, crimson, green and yallow are of startling intensity. 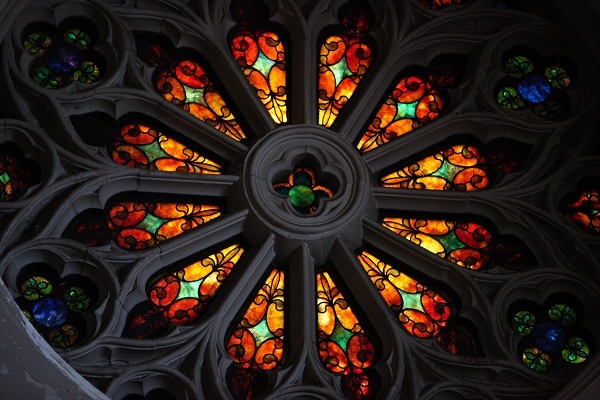 The large number of rose windows offers a series of beautiful color combinations. 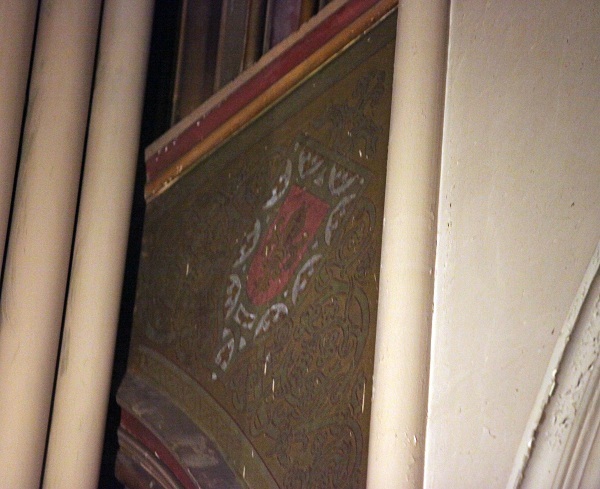 Third, there are remarkable remnants of the the original paint scheme of the church. We are primarily talking here about the ceiling with its intricate stencilling. 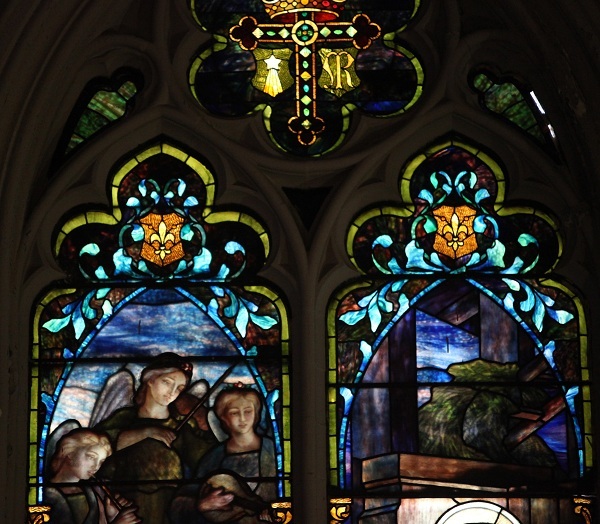 Those whose knowledge of Victorian church interiors is restricted to the several restorations currently going on in Fairfield County, Connecticut will be amazed when they encounter the real thing. 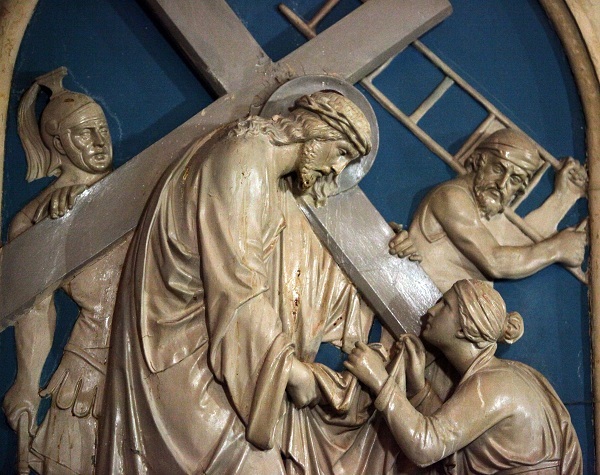 Comparatively little of the sculptural decoration of the interior survives – here a fine station of the cross. 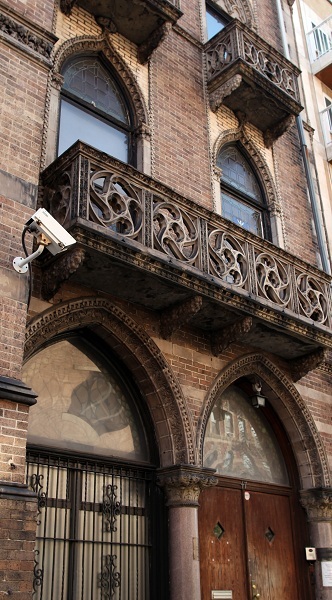 The architectural details are very fine. In contrast, the decoration of the sanctuary and of the side altars – to the extent it has survived – is of lesser interest. Very little original statuary still exists. 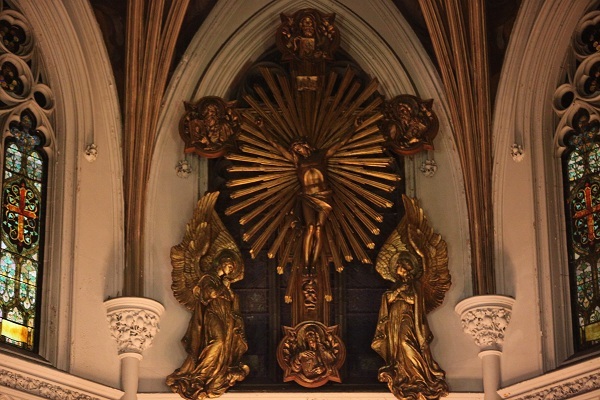 The main altar remains intact, however, it is not that successful as a work of art. All Saints, aside from the magnificent pews, presents a somewhat barren appearance on the ground floor. Moreover, the interior, apart from the ceiling, was repainted some 15 years ago in a drab beige. 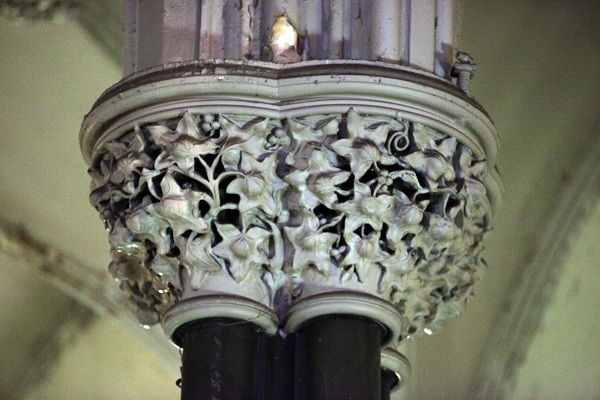 The same paint job has been applied to the organ pipes, which at one time were also elaborately painted. All this “restoration” was the handiwork of a “crazy nun” according to one of the parishioners here. 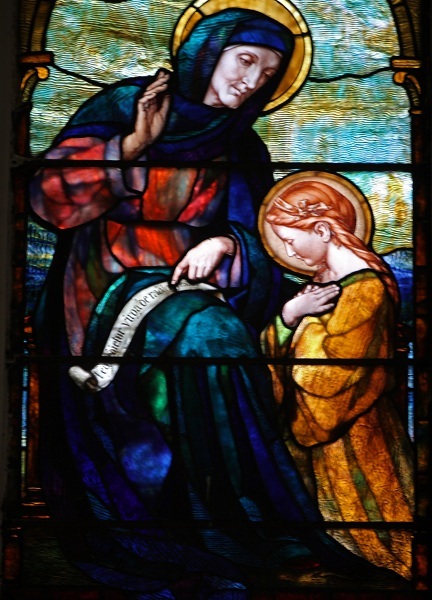 I should add that several of the people with whom I spoke displayed a knowledge of their parish’s history, art and architecture far exceeding almost anything I have heard from those who frequent the far wealthier parishes of suburbia. 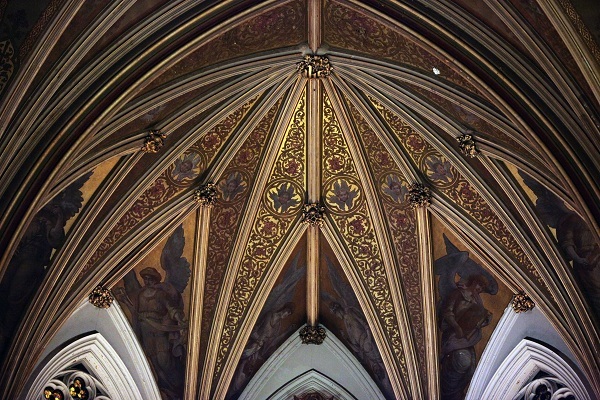 The painted decoration of the apse is more conventional and representative of 19th century parishes. 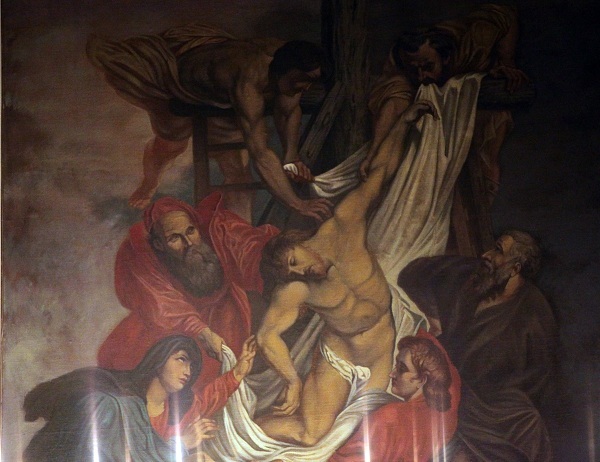 Over the main altar is a not very well executed copy of Rubens’ Deposition in the Antwerp cathedral. 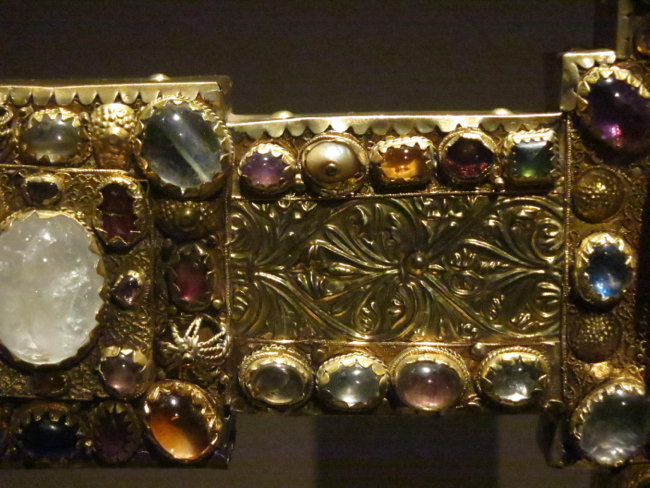 Not all the glass of All Saints exhibits the same originality. 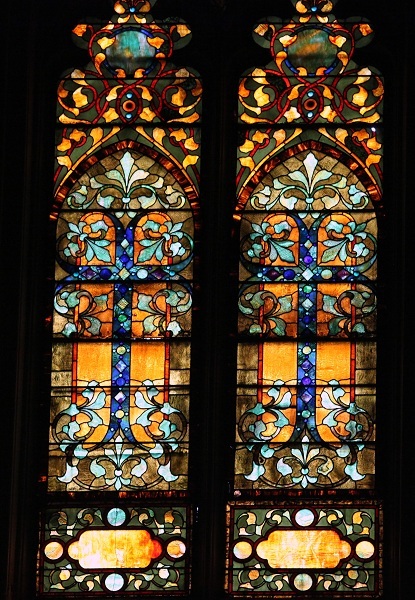 In contrast to most of the other windows, this a German import – windows based on the same composition can be encountered in several other churches in the NY area. 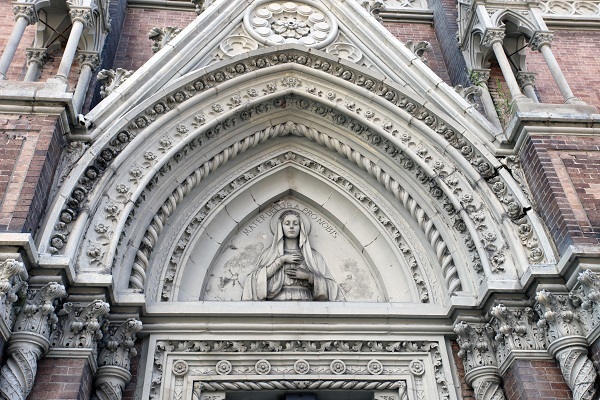 The magnificent facade rose of All Saints. 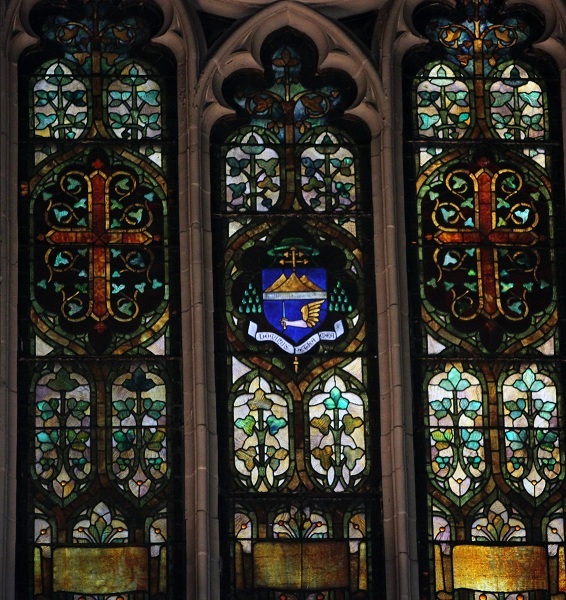 Windows with the coat of arms of Archbishop Corrigan (1885-1902)in the center. 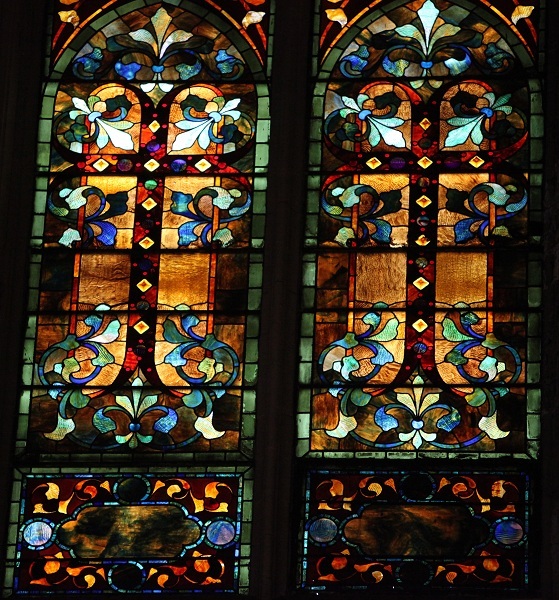 These windows resemble the work of John LaFarge – if so, they must be quite valuable! 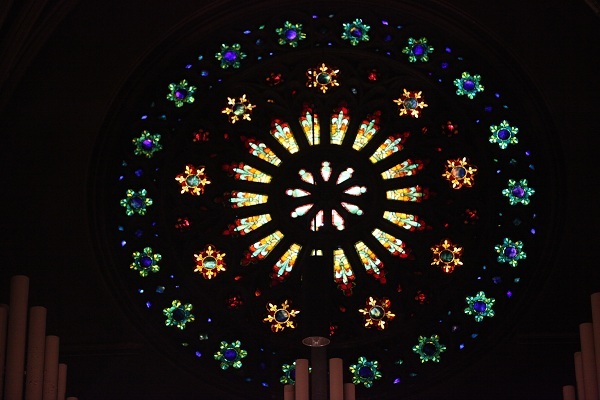 One of the many rose windows of All Saints. 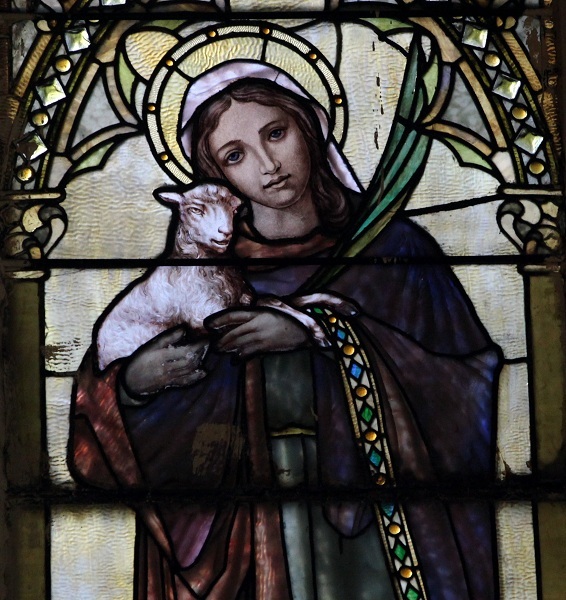 Parishes in Connecticut suburbs are spending hundreds of thousands of dollars to restore or recreate their Victorian interior decoration; yet an original, even more elaborate decoration survives intact to this day on the ceiling of All Saints. The work of the “crazy nun.” Only in the choir loft (in the center of this picture) does the original color scheme of the church walls survive; the walls (right)and the organ pipes (left), also once elabrately painted, are now covered in faceless beige paint. 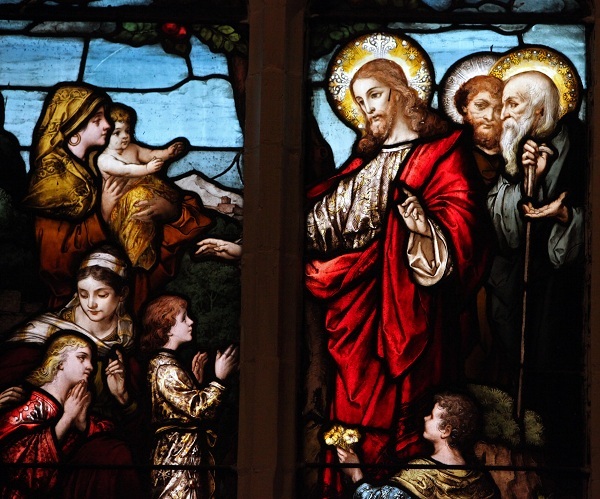 Despite all the “demographic changes” (an Archdiocesan buzzword) in this area, All Saints continued as a flourishing parish, with overflow crowds. What had been an Irish parish became overwhelmingly black. But only in the the last few decades did the parish fall on hard times. The church and the rectory were no longer maintained. Some renovation work that was done, as we have seen, was disastrous. It did not help either that two or three drug rehabilitation centers were relocated to the immediate vicinity. All Saints school was closed in 2011 after operating over 100 years. But a devoted group of parishioners soldiered on. A revival may be underway now. Former residents of the neighborhood have been coming back to services at All Saints, spurred by rumors of a closing. A Spanish mass has been started. The Church received landmark designation in 2007. One has to admire the efforts of a congregation which proudly considers itself “working class” – a rarity in the United States these days – in maintaining such a huge edifice with so little money (and so little outside support). I can only suggest that adding the regular celebration of the Traditional Mass – in a magnificent setting specifically designed for it . It would go along way in bringing back once again the overflow congregations that an architectural masterpiece like All Saints surely deserves. My parents were married here in 1949 and I have great photos of both the interior and exterior. I wish to compare with your photos. Great job ! My dad was the custodian at All Saints church and school from 1977 until 1993. You’ve done a great job of capturing a lot of the detail in design and architecture. I grew up in All Saints. Went to school there from 1st to 8th grade. I would go “exploring” the buildings and there was a lot to see. I’ll share 1 cool piece of info…I don’t know if it’s still there or not but at the base of the spiral staircase that leads you up to the pipe organ, there’s a panel without a handle or anything. That is an entrance to another spiral staircase that leads you straight down into the auditorium…a “secret passage” if you would.